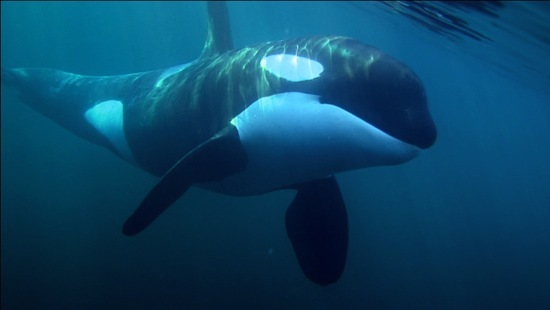 THE WHALE, a Canadian documentary about Luna the orca, is opening on Nov. 18, 2011 at five movie theatres across Canada. The film was directed by producer Suzanne Chisholm and journalist Michael Parfit of Mountainside Films in Sidney, BC. The couple chronicled Luna the orca's adventures in both print and on film for several years. The G-rated film began its US run in September 2011 in the Seattle-Tacoma area and recently played at The Clyde Theatre in Langley on Whidbey Island, WA. Ottawa - The Mayfair Theatre: Post-screening Q&A at Friday evening show (7:30) with Canadian Federation of Human Societys Chief Executive Officer Barbara Cartwright. Intro to film by WWF-Canada oceans expert Andrew Dumbrille. Click here for show times and tickets. Toronto - AMC Yonge & Dundas: Post-screening Q&Q at Friday evening show (7:30) with WWF-Canada Endangered Species officer Jarmila Becka Lee. For show times and tickets, click here. Vancouver - Empire Granville 7: Post screening Q&A at Friday evening show (6:55) with co-director Michael Parfit; WWF-Canada VP of Pacific Conservation Darcy Dobell; and WWF-Canada Marine Science Planning Officer Hussein Alidina. For show times and tickets, click here. Sidney, BC - Star Cinema: Post-screening Q&A with co-director Suzanne Chisholm at Friday evening show (7:15), and post-screening Q&A with co-director michael Parfit at all shows on Saturday. For more info, click here. Victoria - The Caprice Theatre, Langford: Post-screening Q&A with co-director Suzanne Chisholm at Saturday, Nov. 19 matinee (2:00) and evening show (7:00). For more details, click here.